Castle Rock is a city of 2,100 people in southwestern Washington. It is situated along the Cowlitz River between the cities of Longview and Chehalis. 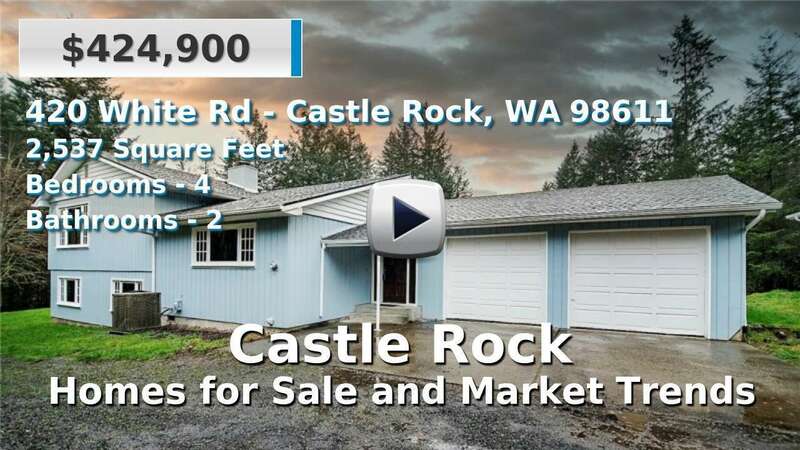 Homes for sale in Castle Rock are about the same average age as those in Washington and the nation; it is a rural area but is less than 60 miles north of the Vancouver-Portland metro area. It is known as the "Gateway to Mount St. Helens" as it is the closest city to the Mt. St. Helens Visitors Center. Just outside of town is Silver Lake and the Seaquest State Park, both popular recreation areas. 2 Beds | 1.75 Baths | 2067 sq. Ft.
2 Beds | 2 Baths | 1423 sq. Ft.
4 Beds | 4 Baths | 4013 sq. Ft.
3 Beds | 2.5 Baths | 1579 sq. Ft.
3 Beds | 3 Baths | 3072 sq. Ft.
4 Beds | 2 Baths | 2224 sq. Ft.
4 Beds | 2 Baths | 2383 sq. Ft.